How come bigfoots don't attack humans more? The man pictured to the left goes by the moniker, Lord Bearclaw of Gryphon Woods. Mr. Bearclaw has been providing Yahoo! Answers since November 20th 2006. 61% of his 7180 were considered best answers. About a year ago someone asked, "is Bigfoot real, or just fake?" and par for the course Mr. Bearclaw's extensive answered got voted up as best answer. 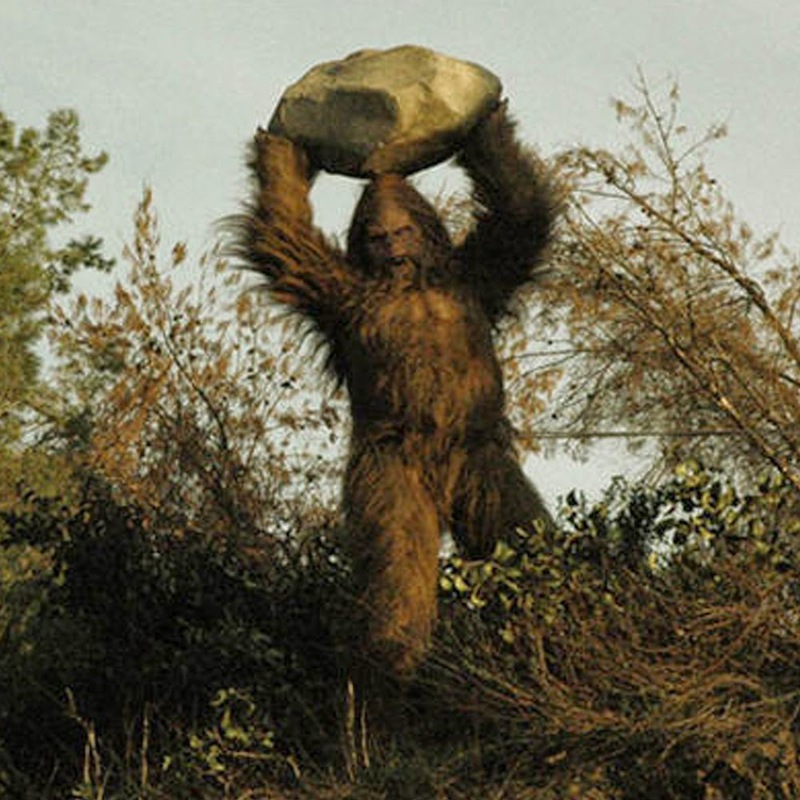 While our editorial "bigfoot news" committee at Bigfoot Lunch Club categorically disagrees with Mr. Bearclaw, we find his answer more novel than most and worth the read. The best part of his argument is if Bigfoot was real, the creature would attack humans more often. How would argue against Mr. Bearclaw? Read his answer to the question, "Is big foot real? Or just a fake?" Bigfoot is not real. For any species of that size to actually exist requires shelter, food, and warmth. A community of primates has to breed to continue their existence, and the numbers necessary for species viability preclude any single small community of Sasquatch. Such a species would need to breed in order to maintain population levels and to offset the death rate from age, sickness, accidental death, and even homicide. Such a large community would require massive amounts of food to sustain, and even if they were strictly vegetarian they would strain the resources of any given area within weeks and would be constantly on the move, foraging and gathering. Yet there is no forensic evidence of any kind of a nomadic primate tribe anywhere. Instead of finding one or two isolated “footprints” we would have come across whole trails of Sasquatch prints, and such trails would be stripped completely bare of any edibles, and would also contain piles of droppings and fur samples caught on the trees and bushes. No such evidence has ever been found. Supposed hair samples of “unknown origin” have been long held up as “evidence”, yet I cannot find one actual report from any scientific lab about such hair samples. As for warmth, even a Sasquatch would find it difficult to stay warm in the Pacific Northwest during the rainy seasons. Even a core temperature drop of just three to four degrees can result in hypothermia and death. This would mean that any sizeable [sic] community would invariably seek shelter of some type during inclement weather, and any member of the community that died would have one of two things happen to their corpse: one, they would be left behind where they died, or two, if the community was carnivorous the corpse would simply be eaten. However, all stories indicate that such creatures would be vegetarian or omnivorous at best, and not aggressively carnivorous. The reason for this is because there are no attacks. A carnivorous community would doubtless find it much easier to raid a human dwelling and carry off the inhabitants for food, especially during winter. Such behavior would be on par with bear learning that it is easier to raid villages and garbage cans than to hunt for themselves. After all, it would be much easier to attack an isolated home than to run down deer through snow. The fact that there are absolutely no corpses found means only one thing: there are no such things as Sasquatch. We have already ruled out carnivorous disposal of deceased members, and such creatures would likely not “bury” their dead, as they could only dig with their hands and any such “grave” would be shallow at best. Such creatures would not be intelligent by any stretch of the imagination, at least not by human definitions, because even Cro-Magnon man made and used tools. Yet not one sample of a Stone Age tool has been found in the woods that isn't an actual relic from the Stone Age, certainly nothing made in the last two hundred years that wasn't easily identifiable as having Native American origins. No shovels, no hammers, no axes, no spears. So if they are not intelligent enough to use tools, then they are certainly not intelligent enough to completely conceal their existence or to dispose of their dead in such a manner as to preclude discovery of the corpse. With the numbers needed to maintain genetic viability of such a community, nutritional requirements, and the need for shelter as well as forensic evidence, it is flat-out impossible that we would not have found or captured a living Sasquatch by this time, especially with the sheer number of hikers, campers, hunters, ATV enthusiasts, forest rangers, Bigfoot “hunters”, people who live in homes deep in the woods, scientists, etc. etc. etc. Does Mr. Bearclaw have a good argument, do you have a counter-argument?